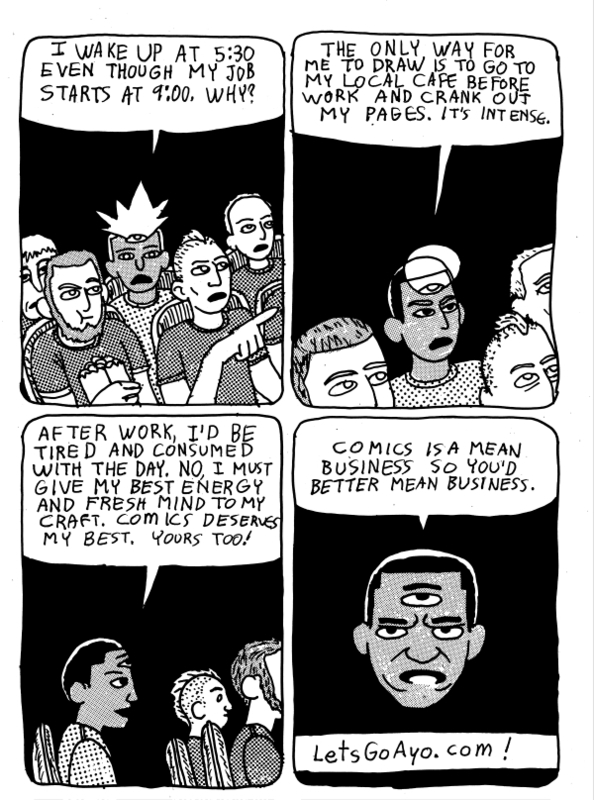 Comics is a Mean Business. November, 2009. Darryl Ayo. Still true to this day, I really do this. 1) Reading: Sometimes, the best way to draw comics is to start by reading some comics. Something that you’ll like to get your excitement up. 2) Doodling: There’s that big problem of wanting to draw but not knowing WHAT to draw. Just drag the pencil across the paper and see what comes of it. Don’t put too much effort into trying to force a point or force an issue. If you feel like drawing stacks of pancakes, just draw stacks of pancakes. These warm-ups are good for your art-muscles as well as for your psychological fear-barriers. 3) brainstorming: Similar to doodling, but since we cartoonists are often the writers as well, it can be helpful to string out random words, phrases and ephemeral ideas that aren’t quite rooted yet in concrete thoughts, but nonetheless can be woven into the fabrics of your themes and passions. Again, just move your pencil, the rest will follow. 4) Pick up where you left off: The wise and clever know that it can often be helpful to start a piece of work and allow oneself to complete it later when less inspired. As indicated in the comic strip above, I often work just after awakening. That means that I don’t always have the endurance or mental capacity to produce big finished works. When I pick up a page that I have left previously uncompleted, it’s not as much of an effort to carry on from where a more alert Ayo left off. 5) Modest goals: I’ve only got about an hour in the morning. Less, if I am late in arriving at the coffeehouse. You should know what can be completed. Perhaps you might letter a few panels. Perhaps you can ink two characters’ faces. Give yourself micro-benchmarks and don’t beat yourself up if you’ve got a full-time job and you can’t draw a full page per day. Make your goals manageable for your lifestyle and responsibilities. 6) Do other things: Spending every waking moment or every free moment working on a single project might not be healthy. Some can manage this, most cannot. When scheduling your work, be prepared to allow yourself time to be sick of your primary project. Plan out a secondary project or allow yourself to skip your drawing time in order to read, go to a museum or take part in some other productive activity which will enrich your creativity. On September 10th (a couple of weeks), I will be sitting at the House of Twelve table at Bethesda, Maryland’s Small Press Expo. Surprising everyone, including me, I have been nominated for an Ignatz Award in the category of “Promising New Talent” for my comic strip that appeared in House of Twelve Monthly #3. ComiXology distributes House of Twelve Monthly as a digital comic. You can see download the first issue for free and investigate the other issues as well at our product page. For those in NYC who will NOT be making the trek to Bethesda on September 10th, brace yourselves for excitement: Jaime Hernandez will be appearing and signing books at Brooklyn’s own Bergen Street Comics. Jaime Hernandez is so important that I don’t believe that he requires MY introduction. Go meet a king, people. Speaking of Bergen Street Comics, Mike Dawson will be premiering his book Troop 142 on Friday, September 2nd at Bergen Street. You’d better go say hi. At the same store, Cliff Chiang will be signing Wonder Woman #1 later in September. MEREDITH GRAN, will be signing her new book LISTEN AT HOME WITH OCTOPUS PIE this Thursday at Desert Island from 7pm-9pm. Meredith is a terrific cartoonist worthy of all of the praise that she receives. North Brooklyn, don’t be late. NB: Comix Cube is not to be confused with The Comics Cube!